I had to run some errands in the city yesterday, so Argy came along and we made a bit of a day of it. 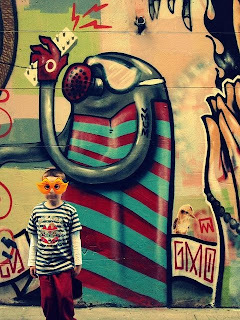 After admiring the treasure-troves at Tessuti and Cake Deco, we spent some time exploring Melbourne's quirky city lanes. 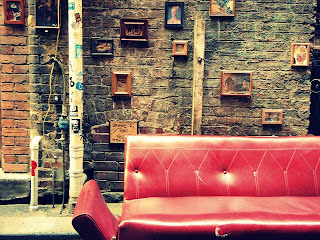 My favourite was Presgrave Place (above) where we found this ramshackle red couch and art prints hung along the brick walls. 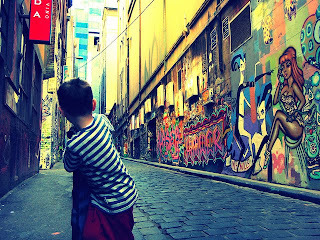 I would have felt quite at home in this alley, if it weren't for Argy standing holding his nose disdainfully: eeewwww ... who's making that awful stink mum? (Er, perhaps more like home than I thought). In Hosier Place, Argy enjoyed blending into the surrounds. We spent ages admiring the amazing artwork. A lovely time had by all. (Note to self: must remember to reiterate that crayon on walls at home does not fall within the bounds of street art). I admit, I love to look at Melbs alleys but I'm with Argy - what is it with the smell? Why do people find the need to pee in alleys???!!! Great photos! Wonder if anyone would blink an eye if he contributed some of his own artwork to the walls? Ha - my confirmation word is SUREALI. Surreally? You have made me even more excited about my trip!!! EEEEEEeeeeeeeeeep!! Great outing - you might want to specify the 'washable' textas too! Looks like a great outing. Love that first photo. It's an artwork in itself. This is an awesome blog post found here... Its really very interesting, Thanks a lot for the share.... Keep it up!